This post has been sitting in my drafts for a little while, but I thought it was high time to get it posted! 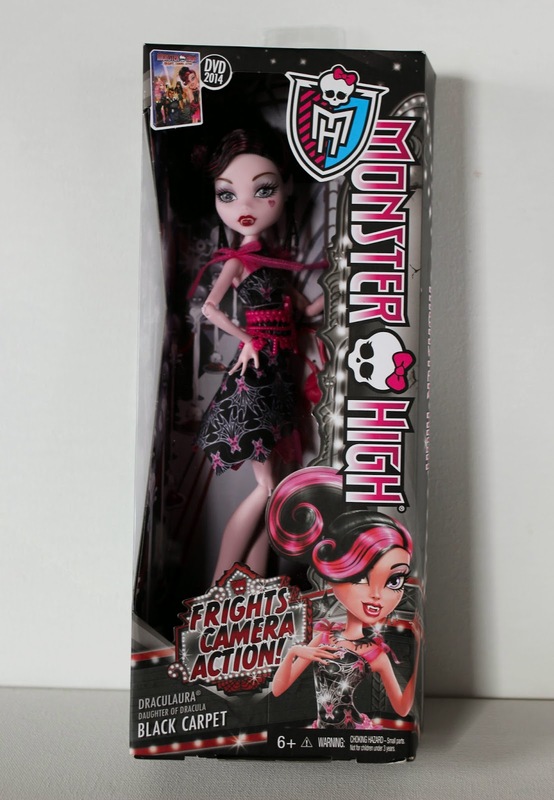 These two dolls are from the Monster High Frights, Camera, Action movie. They are both "budget dolls" and I purchased them each for about $11.99 on Amazon. 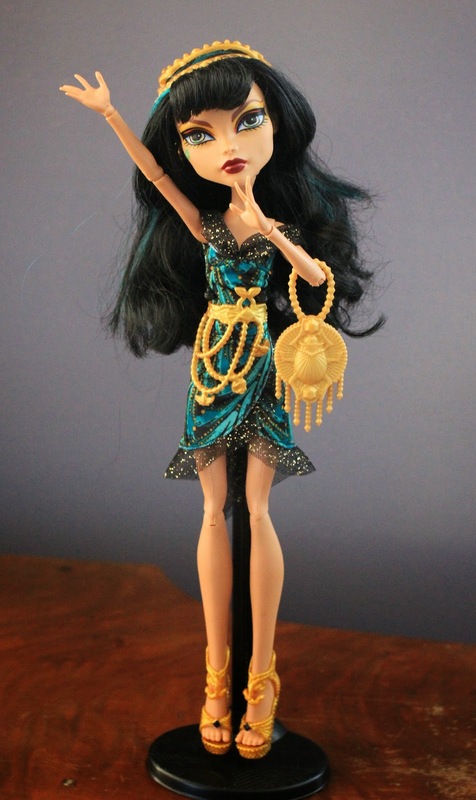 The cheaper "Black Carpet" line features Clawdeen, Cleo, Lagoona and Draculaura. I ended up getting all 4 of these ghouls and they were actually my first versions of each character! 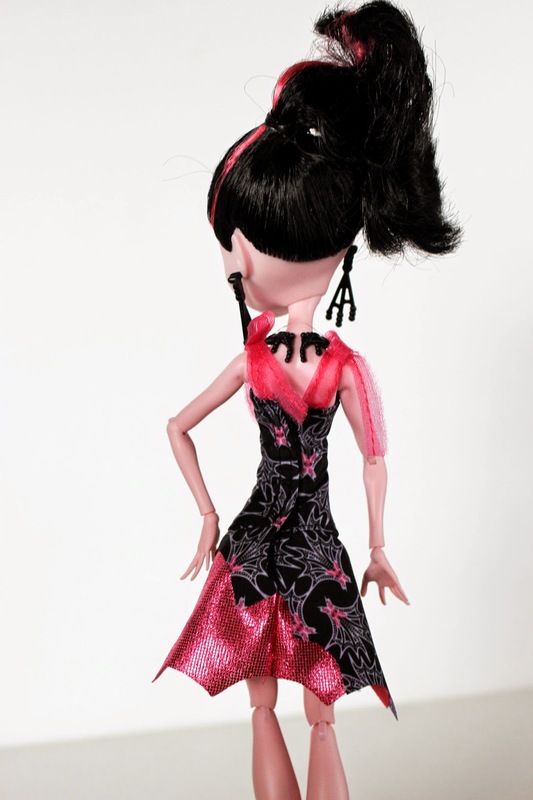 Draculaura's outfit is a simple black and pink dress with a pink belt and pink (fabulous!) shoes. The dress is really cute, and is designed with pink long-eared bats whose wings resemble spider-webs. Her hair is mostly black w/ a few pink highlights and is pulled up into a high side ponytail with side-swept fringe. Her make-up is surprisingly pretty natural looking for a "black carpet" event. I don't mind how they paint her fangs, but it sort of looks like she has a mouthful of milk and it's dribbling out the sides. Here's a closer look at her shoes. 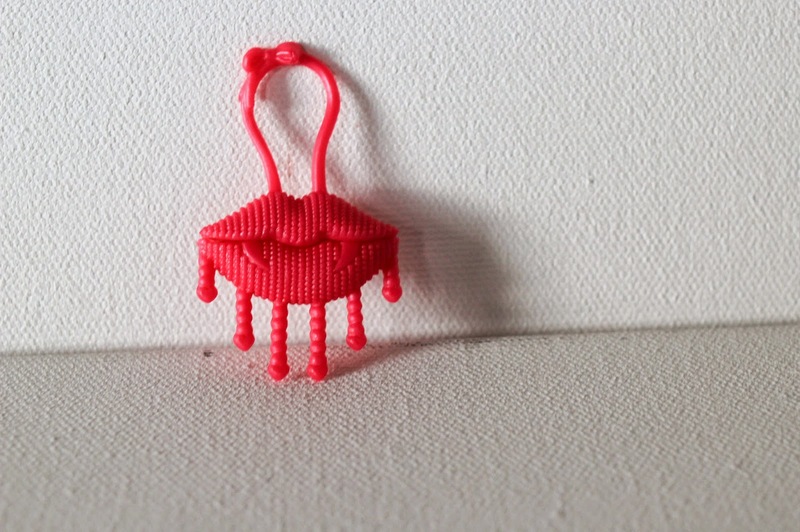 I love the little lips! 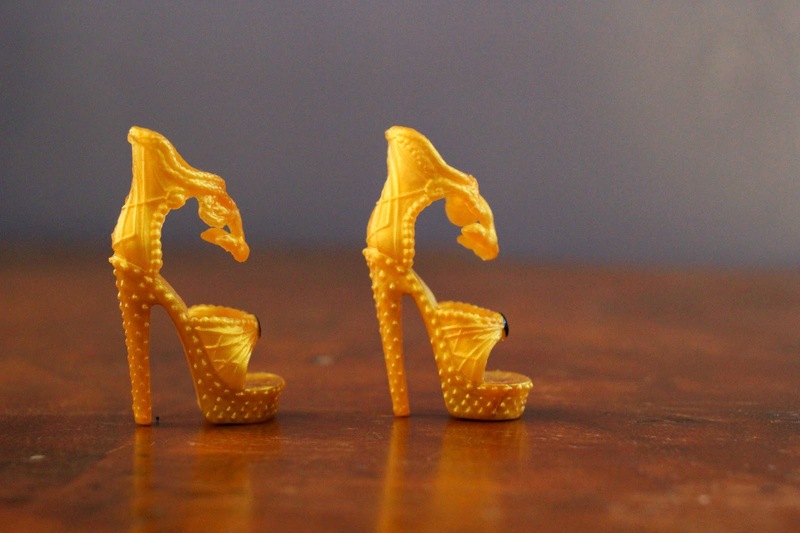 Monster High shoes really have amazing details on such a small scale. Here's one more look at the back of her dress so you can see a bit more of the details. The hem is cut like the shape of a bat wing which is very clever. Cleo has sort of a 1920s vibe going on with her outfit and style. She is dressed in gold, green and black and I absolutely love her dress. 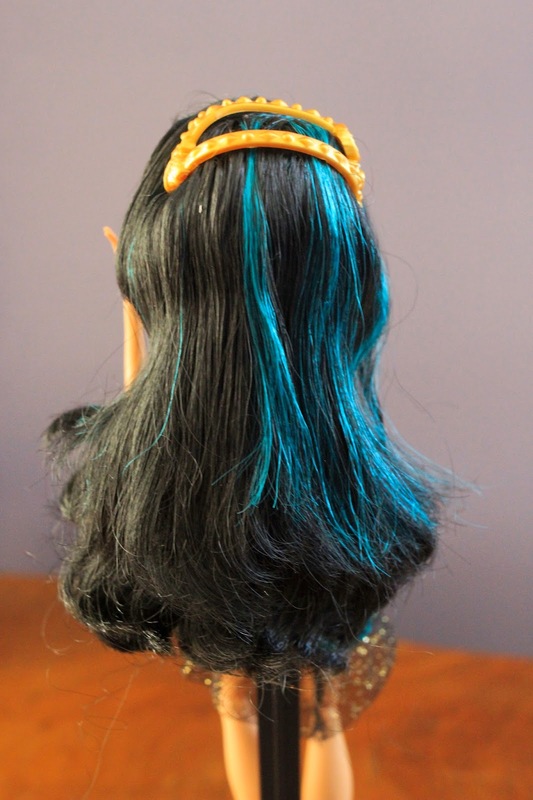 I think she is my favorite Cleo so far, but I am really looking forward to getting the Boo York 2-pack with her and Deuce. Her make-up, like Draculaura's is kept simple and clean. Her red lips are the perfect balance to her strong, but not over-done eye paint. It's hard to tell by the photos, but her lids are a fusia/pink color and her upper and lower lids are yellow. Her brows are defined and sharp, but I like that they colored them a medium brown instead of black, which gives her a softer look. Of course, she has her signature jewel placed over her right cheekbone. Her head piece is really nice as well. I kept it "stapled" to her head for now just so it would stay nicely on her head, but I've since removed it so I can brush her hair better. 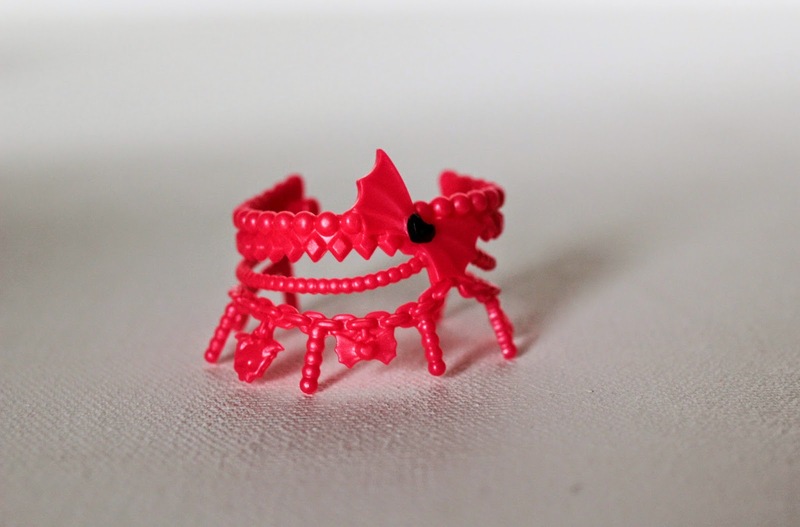 I think that squigglely thing is supposed to be a coiled snake on the side slithering up the head piece. Her hair is really thick and soft. This is one of the few Cleos that doesn't have any tinsel, which in my opinion is good because I feel like the tinsel can be difficult to keep looking neat. Initially there was a bit of gel in her bangs, but it was pretty easy to comb out. It may be a little hard to tell, but one of the features I find really enduring on Cleo's face mold is the tiny dimple she has on her left cheek. Since this is my first and only Cleo, I am curious to know if this is the same on all of the releases. 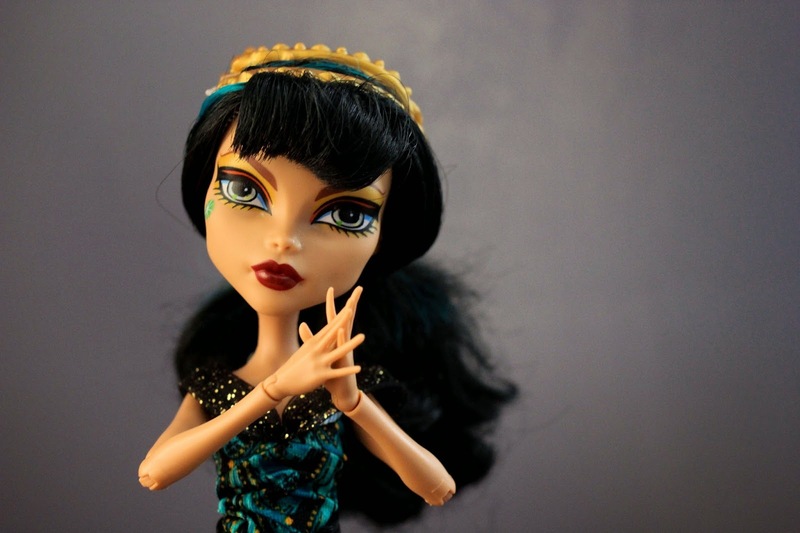 Cleo is like the "Angelina Jolie" of Monster High dolls. (Not personality, just looks!) Her features remind me a lot of her -the cat eyes, great cheekbones and full pouty lips. 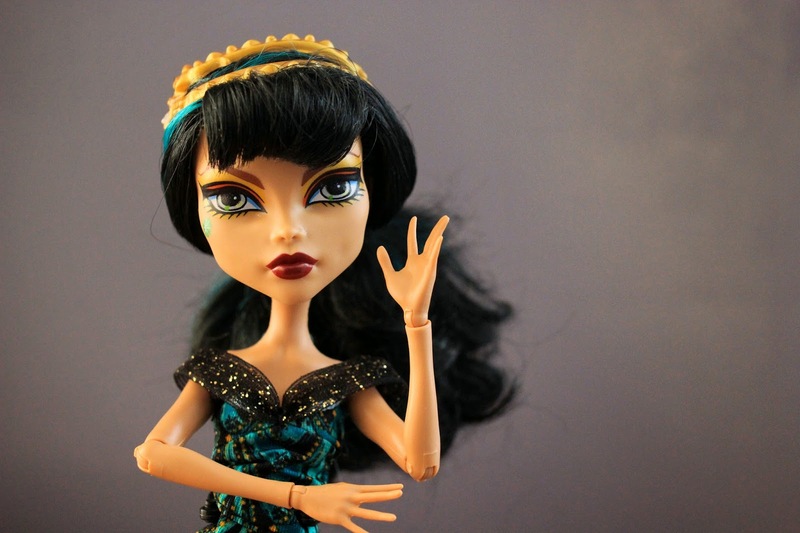 I think Cleo dolls have a tendency to be a bit wonky-eyed as you can see above, so I would recommend always trying to buy your Cleo dolls in person to get the best one on the shelf. Not loving the snow so much. 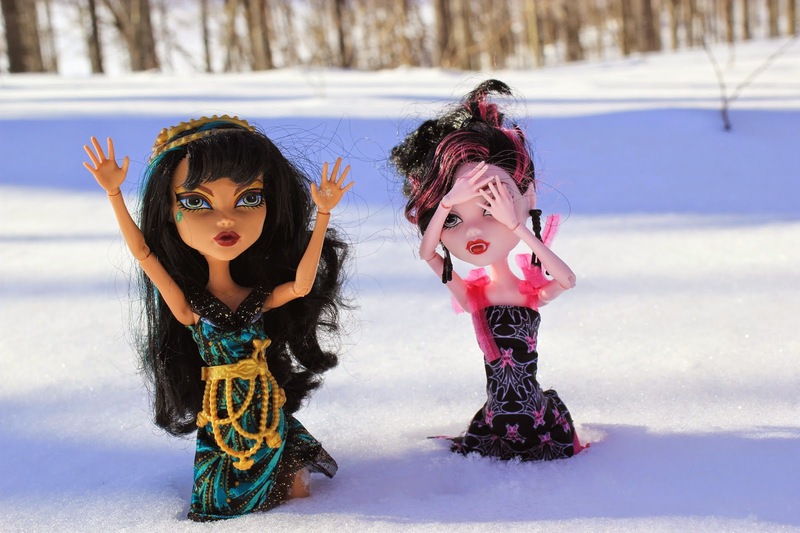 "Oh, it's not that bad, Draculaura...the snow makes me look so beautiful, doesn't it?" I took these photos in February. For anyone missing the snow (ha!) I hope you've enjoyed these photos. Details on those dolls are amazing, even though they are just "budget dolls". Thanks for commenting, Margaret Ann! I know, for just about $12 they are great! Hey, get Draculaura out of the day light! lol I love the colors of her outfit in addition to the lip and bat themes. 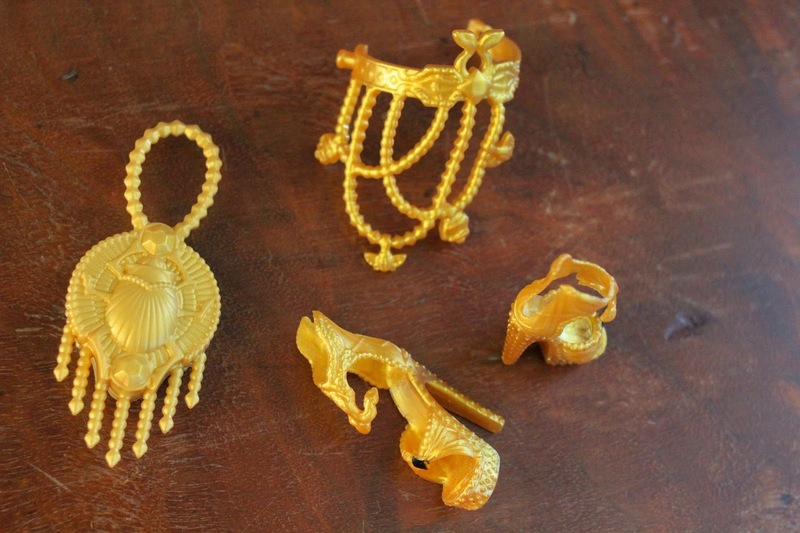 Cleo is so elegant with all of her luxurious gold! Lol, The grandmommy...you are right. Draculaura was not a fan of the outdoors. ;) Are the details great? 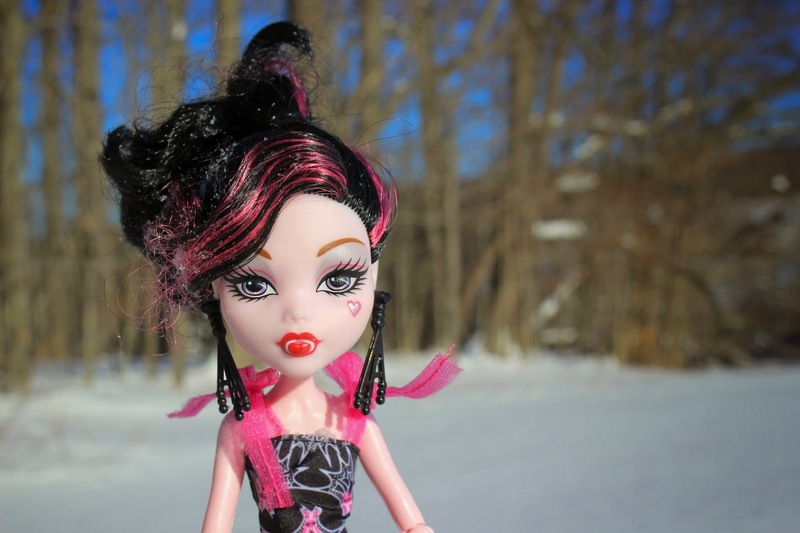 I'm not into these dolls, but I love to see your photos of them, particularly of them in the snow, they're so bright and sharp!